Each type of coverage must have a minimum coverage amount of $10,000, and both have important distinctions. PDL insurance covers any damage that you, a family member, or other covered individual driving your vehicle may cause to another person’s property while driving. If you rear end someone else’s vehicle or if you back over your neighbor’s mailbox, PDL insurance will cover the damages to the vehicle you rear-ended or replace your neighbor’s mailbox. However, PDL will not pay out anything for damages your car may have incurred in either of these two scenarios. Hence the term “liability” in the name, as the insurance protects you from being liable for damage you may accidentally cause to another person’s property with your car. The state of Florida does not require you to carry coverage that insures your own vehicle, although it’s certainly recommended. Another type of insurance, bodily injury liability (BIL) insurance, covers medical and funeral costs you, a family member, or other covered individual may cause while driving. This insurance is not required by the state, has higher coverage amounts and subsequently higher premiums. However, BIL decreases your liability if you or another covered person driving your car is the cause of a major accident. Not requiring BIL is another way in which Florida differs from most other states. Only one other state in the country, New Hampshire, does not require drivers to carry a policy with BIL. If you own any sort of major asset, including your primary residence, consider adding BIL coverage to protect yourself. The state minimum coverage will definitely not protect you in a serious accident. Florida is one of only a handful of states with no-fault auto insurance laws. The no-fault insurance laws were instituted to keep monthly premiums low by delivering quick payouts on behalf of at-fault drivers and avoiding costly lawsuits through limited liability. When it comes to a medical claim in Florida, the first $10,000 of coverage will come from your own car insurance policy regardless of who is at fault. 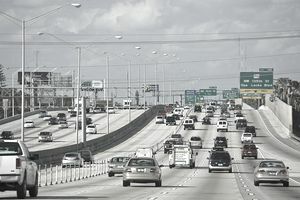 Largely due to no-fault laws, companies selling auto insurance in Florida can offer premiums that are lower than national averages. However, critics of no-fault laws say the legislation protects at-fault drivers from lawsuits that could result in loss of major assets and thus results in more reckless driving. A study published by the University of Pennsylvania confirms that no-fault insurance correlates with more drinking while driving, greater incidents of speeding, and higher fatality rates overall. Aside from safety considerations, many criticize Florida’s no-fault system since it often is abused. Quick PIP payouts can lead to instances where medical clinics fabricate or exaggerate injuries to reach the $10,000 maximum. The Florida Department of Financial Services receives thousands of PIP fraud tips and makes hundreds of arrests each year.